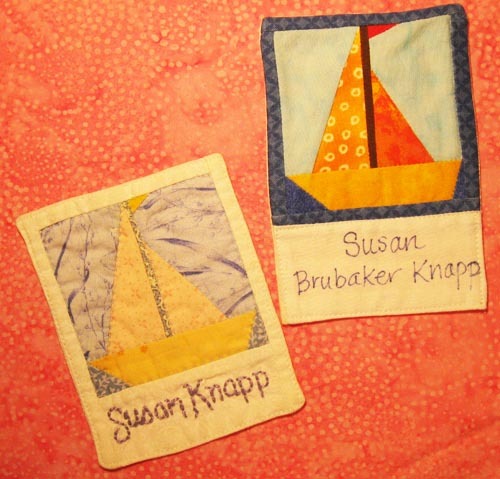 After you make the block, you can frame it with a bit more fabric so you have room for your name. You can either write your name with a permanent marker, or embroider it. Then simply place the front of the nametag right sides together with your backing fabric, and stitch them together around the perimeter, leaving several inches unstitched so you can turn it right side out. Clip the corners, turn right side out, press, and hand stitch the opening closed. Add a pin backing, and you are good to go! This entry was posted in Uncategorized and tagged nametags. Bookmark the permalink.